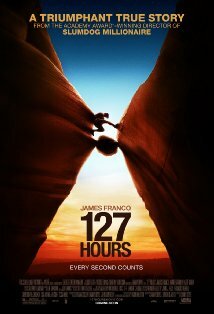 127 hours is an intense thriller, that packs in an immense depth of character and range of emotion, in what is really a simple story. It follows the real life story of a happy-go-lucky outdoors loving hiker, whose arm gets trapped by a boulder in the narrow canyons of Utah. Over the next 127 hours, he gathers enough courage and recklessness to extricate himself, by essentially separating his arm using nothing more than a worn down pocket knife. The hiker in question is Aron Ralston (James Franco) who underwent this ordeal in 2003. Aron sets off one Friday evening, without telling anyone, to hike the wilderness of Utah. After an overnight sleep he begins his bike ride, that quickly turns into a hike, where he meets two young female hikers. After revealing an underground lake to the two, he continues his hike. Navigating through a crack in the ground, Aron dislodges a boulder that rolls over trapping his right arm, pinning him in the middle of the desert. After he overcomes his initial anger, Aron realizes that he is probably going to die there. And with the realization comes the clarity of thought that makes him relive his past, and appreciate the importance of all that he left behind. With no food, running out of water and in on position to sleep, his condition deteriorates, till he starts hallucinating about that which has been and that which is to come. James Franco is brilliant as Aron, with all his triumphs and all his faults. The cinematography plays well on the themes of loneliness, regret and claustrophobia. Music is as much a character in the movie as Aron is. Scored by A.R.Rahman, the background ventures daringly into the narrative, deftly taking it over in places before letting the visuals claim back the storyline. And yes, there is that wrenching scene as Aron snaps the radius and ulna of his forearm, before beginning to hack through the remaining muscle. There is more than enough of an anatomy lesson as the hard nerves refuse to be sliced, instead choosing to overwhelm an already tired mind with more pain. What epitomizes the movie for me is not the butchery, but the moment as the last tendons snap away and Aron is thrown clear of his own arm. The simultaneous sense of loss and freedom leaving Aron and the audience together in stunned silence. And that is what the movie is about - not the story of the guy that lost his arm. It is rather the story of the guy, as he lost his arm. While it is not a movie for the faint of heart, it is for everyone that is looking for a reason to take life to heart.